Let’s get the Christmas dinner party started! But be careful if you have got a food allergy and read about the most common food allergens in the Christmas menu. This issue brings a touchy story by Hans Christian Andersen and funny stories about first time skiing experience and Christmas cooking. Don’t miss the newest Star Wars movie. 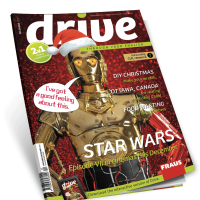 If you are a DIY fan, you can make a great wreath with Drive. Merry Christmas!